Late last year, Bruce Springsteen announced he’d take the E Street Band on the road to support the new Ties That Bind: The River box set. The decision caught long-time guitarist Nlis Lofgren, who had booked his own tour. Lofgren had to cancel his dates to accommodate the Boss but he’s happy to head out on the road to play the album in its entirety. During a recent phone interview, Lofgren spoke from a New York hotel about the Springsteen tour and about UK2015 Face the Music Live, which he recorded last year while touring with his longtime collaborator, the multi-instrumentalist Greg Varlotta. 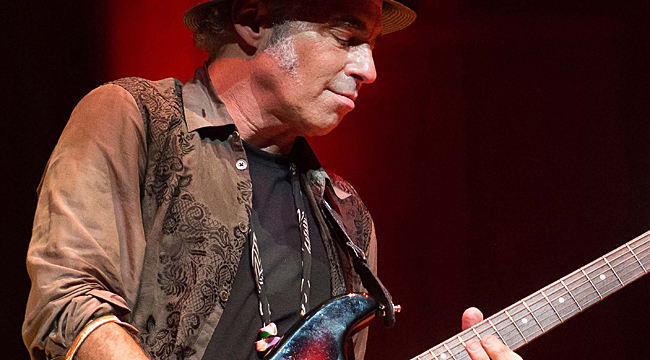 The Face the Music tour followed the 2014 release of Lofgren’s Face the Music box set, a nine-CD/one-DVD retrospective covering near five-decade career. Between touring with Bruce and doing solo shows, you’re more active than ever. Did you ever imagine you’d be so busy at age 64? No, honestly. I was an accordion player from age 5 to 15. I used to play Beatles’ melodies on my accordion at the ninth grade variety show but I didn’t even touch the guitar until I was 15 and my brother Tommy showed me some chords. It never occurred to me. In Middle America, we loved the Beatles and Stones and Hendrix and of course everything that went with it. But nobody thought you could do that for a living where I lived. One night, I saw the Who and the Jimi Hendrix Experience in the same night at two different venues in D.C. I still remember being uncomfortably possessed with this notion that I needed to try to do it as a living. It seemed so foreign to me. I still remember it as an uncomfortable possession that wasn’t even on my dream radar. When I finally threw my hat in the ring, I’d sneak backstage because I knew nothing. I was playing for nothing everywhere and trying to pay my rent and water bill with my bandmates. I asked for advice. I got some great advice. One of the highlights was Neil Young befriending me and taking me under his wing. There were a lot of ups and downs and a year later we were headed to L.A. to look for record deals and became the Topanga Canyon house band. While we were finding our way with our producer David Briggs, Neil asked me to play on After the Gold Rush at 18 years of age. That was an enormous challenge and opportunity for a rookie musician just on the road trying to make his way. That served me well. I remember going to work and thinking, “It’s nice going to work and not having to be the boss today.” I liked being part of a team of people and playing rhythms and singing harmony. That served me to this day. I’m happy to lead any band anywhere. If we’re in a bar jamming and someone says, “Sing something,” I say, “Okay, follow me,” and off we go. But I do thrive in the band setting as a member of instead of always the leader. That’s served me well all these decades. Talk about UK2015 Face the Music Live. My wife Amy designs the T-shirts and CD covers and posters and doesn’t always come on the road but she loves coming to England. Halfway through the tour she said they were some of the best shows we’ve ever done and that we should record them for an album. It wasn’t on my radar so hats off to Amy. To make a long story short, after thousands of hours of work, we got a great live CD out of it. It’s a footnote to the ten-disc Face the Music boxset, which was the best of 50 years of recording. The press release describes the album as a “personal musical journey” rather than a greatest hits. Is that the approach you wanted to take? Greatest hits don’t always work. First of all, I never had any hits, so there’s that. One of the dreams of most writers is to reach people. I’m hoping to get good enough to get more people to the shows. At the same time, I’m not burdened to play the five hits. I play what works for the audience. There’s the musts and the favorites you can rotate in and out and hundreds of other songs to choose from that, depending on the tour and format and how you feel, you might find some to weave in on or out. We spent two months in England and tried to play five or so different songs each night. One of the highlights is “Miss You C.” That’s such a great tribute to Clarence Clemons. Talk about what the man meant to you. So you were promoting this album when you got the call that Bruce was going to be hitting the road in 2016? I knew about Saturday Night Live and knew there were no plans past that for us to play. I booked five months of work. They had a true change of heart. I’m not involved with the blow-by-blow decision-making. It’s like when me and Amy sit around with my four dogs and wonder how much time I’ll spend on the road. I don’t call my bandmates and have them weigh in. it’s always a blessing. I’m coming up on my 32nd year with the band this May. It’s no fun to cancel or postpone shows. I’ll try to reschedule them all. It’s not like I had a huge choice in the matter. These clubs will forgive me and understand I hope the fans will come and see me when I make up the dates. What has it been like to revisit The River? We played all those songs in some form off and on for the past 32 years. We did the whole album once in New York City. I love the songs. To play them as a set piece is very powerful. I moved to L.A. in 1968 and had lived there for years when I ran into Bruce in the early ‘80s. We go back to 1970 when we did an audition night for Bill Graham’s Fillmore West. I was always a fan. I would see him and his band in the ‘70s and ‘80s. I bumped into him at the Marquis. He mentioned that he had just finished a double album called The River. He asked if I wanted to listen to it. I was very grateful for that. He threw me in the car and went over to the studio. He sat me in front of the old NS-10 speakers, which were popular playback speakers. I listened to the whole double album and I still remember being struck by how I felt like they got the sizzle and electricity of the live show into the grooves for the first time in terms of making records in a wholesale fashion. They got that sizzle into every track. My favorite thing is playing live when there’s that sizzle and energy and crackle in the air. It’d deafening and maddening and it’s just a muddy mess of musical insanity sometimes. That’s part of the live experience. I felt like they got that into the record. Now, God knows how many decades later to be playing it as a set piece and adding my bit because I wasn’t there is a great honor and I’m embracing it. It was released during a recession. Do you think the songs reflect that? I think it’s more about personal struggle. I love how Bruce writes. He’s as great a lyricist as we’ve ever had. That’s his forte if I had to pick one. Either you’re at peace and everything is okay with friends, family and money or there’s something coming apart. Sometimes, it’s all coming apart. He speaks to that more from the common man perspective but doesn’t exclude everybody because it’s more about the internal workings of man and the inherent human nature of greed and satisfying yourself and never having enough of things. It’s the reality of how is your family doing. Maybe your wife is sick. Maybe my parents are getting old and feeble and what do I do? It’s all in there. You’re sitting there inconsolable with “Stolen Car” and then he starts “Ramrod,” and it’s a wakeup call. It’s back and forth. I’m that schizophrenic writer myself. I do country, blues, rock, R&B and metal. It all comes from the blues and folk. Bruce has put it together in his own voice as well as anyone in history as ever done. I’m happy to sit there and play these songs that are so dear to me and add my piece to it and know that I have good instincts for it. Springsteen has said that the album was a gateway of sorts to the writing that would emerge on subsequent albums. Do you think of the album in that way? I mean it’s not all doom and gloom. It’s about the best of the human spirit. There is doom and gloom. If you’re smart, you’ll go and get out of your head and play basketball or football. Or play music for fun. Or paint or sing. You might interact with friends and family and things. Things that are funny and joyous and physical. Some people find comfort in their jobs. I’m lucky in that I am one of those people who can find a comfort even in my job.